Whether you’re lucky enough to be in a town that allows dogs indoors or not, it’s very important to know dog etiquette for dining with your pooch. Always bring a toy you don’t have to throw or a special treat. 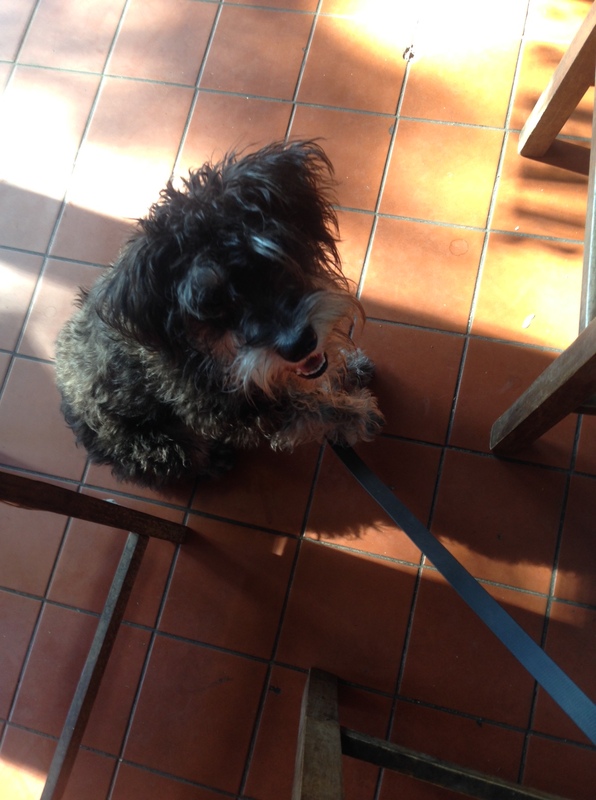 Woof Woof has been going to restaurants, bars and coffee shops since he was 7 weeks old. There were definitely times where he wouldn’t have behaved if he didn’t have a toy or treat to preoccupy him. When he was little, the best toys were chew toys. I always had a variety of small chews with me, even a teething ring. At the whopping age of 8 months, now he likes a large biscuit or a plush chew toy. I carry both. Be prepared to leave if your dog doesn’t behave. There are a million reasons why your dog may get antsy. Sometime I have to take Woof Woof outside and see I he needs bathroom break or just a I-need-to-walk-a-bit break. He also may need water or food. Woof Woof has only had to leave a restaurant once. It was when I couldn’t answer his needs any other way. He learned that if he wants to stay inside the restaurant, he has to behave. Have a set procedure for dining. 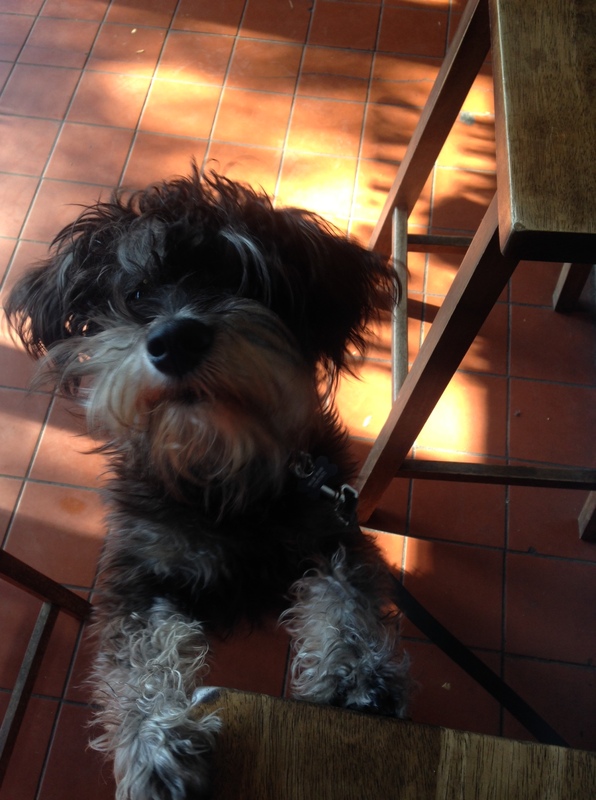 Woof Woof knows his leash gets tied to the chair or hooked to a coat hook underneath the bar. He then lays down, sits, plays with his toy or eats his treat. Expect him to be on your lap for part of the time. Woof Woof is very comfortable sitting on my lap. I can put a plate on his back, and he won’t even reach for food. Being able to sit on my lap part of the time makes him feel like he’s getting enough attention without acting out. Make sure your dog has social skills for greeting other dogs. He’ll give other doggie diners a quick sniff, and sometimes he gives a play invite. Play invites are generally on leash and depends on the type of restuaurant. He’s not going to play in a fancier restaurant. I pick him up and tell him no if he’s play level isn’t right for the restaurant’s environment.